MC Hammer! I remember being with my best friend and having to lie to my parents about where I was going. Ha! Yeah, I saw the Dead too. Honestly, I’m not the biggest fan but it’s definitely an experience to go to one of their concerts. My first concert was Billy Joel. It’s funny because I became such a metalhead shortly afterwards, that I was alway embarrassed to admit it. Not anymore though. Billy Joel is awesome. Billy Joel is OK by me. In the early days I would record music videos and I still have Billy Joel’s video “Pressure” which I think to this day is one of the neatest theme/visual combinations of all time! Wide variety of music to see live. Very good first and thanks again! I don’t know if I ever saw that video…or if I did it was a long time ago. I’ll have to revisit. Mine is a very old – low quality VHS copy (like a lot of my old videos LOL!) I have not tried to find a good copy on-line, but if you are a fan you will love it! I’ll have to add that to my list of go tos when I’m bored at work, ha, ha! Ahh hhhhh! To be bored at work LOL!! Cool. Oh yeah, always. Certainly gives me a lot of down time to get stuff done. It’s funny because when I’m busy with work stuff I think to myself ‘I didn’t get enough done at work’…meaning personal things. Now that is pretty funny. Not bad at all! I remember that concert, they were traveling with the Merry Pranksters; not another band but a group led by Ken Kesey the writer [of “One Flew Over The Cuckoo’s Nest” and they were responsible for the balloons. They were just travelling with the band, as many did. Yes indeed! I was awed. 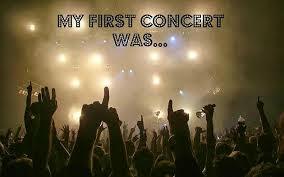 But what was your first concert? What do you remember about it? That may have been it, the Dead at U.C. Fieldhouse, at least I don’t remember any others. Led to a life-long love of their tunes. Just trying to remember if I read Kesey, before or after. Coo. I was not sure how many other concerts you had been to. Good question! My first concert was Garth Brooks. It was the year Friends in Low Places came out and I was thrilled because he did it live on stage. See. There are differences in the experience. I was not that familiar with the songs in my first concert. But it sounds like it would be really cool to have a great band perform a new song you are hearing and singing all the time! I appreciate your comments. Thanks! Strangely, my first proper concert was Metallica… I saved for months in a row to watch them. I cried through some of the songs because I felt so grateful that I was able to catch them live. It was such an amazing experience and it’s something I can never forget. Not strange at all. For a live performance they had an exciting show! I use the word grateful too. That means a lot. Thank you for sharing what was obviously a powerful experience! How exciting! Great band, great venue, great company can make a wonderful first. Thank you for sharing that with us! I think it was Led Zeppelin, in an open air stadium in Auckland in 1970, just after Led Zeppelin 3 came out. They had flown in one and a half tons of equipment. I was at the front in the middle and was a total prisoner of the sound but fortunately it had no unintended distortions. Some friends had a flat about half a mile away and their front verandah was a great place for the concert. Wow! Thank you for sharing. Right place at the right time, good for you! I have thought myself a prisoner of the sound on numerous occasions! My first concert was technically The Backstreet Boys. I was 10 years old. Boy bands were popular. What can I say? I had yet to discover the good or real music. So while that may have been my first concert, my first real concert was when I was 14 or 15. I saw Switchfoot for the first time on their Nothing is Sound tour. They played at this little dive bar near my house. I was standing right up against the stage, the barricade bar separating me from the band. I remember the energy, from the band and the crowd and how each seemed to feed off each other. I still remember being completely blow away by their performance…and connection with the crowd. There may have been a barricade bar up, but that didn’t stop Jon, their lead singer, from joining the crowd. Yes, that’s right…he stood on in and jumped over it, joining the sea of people. He raised himself from the stage to the bar and stood right in front of me. And when he did, he stepped on my hand. And my hand was stuck, being crushed under his weight. The strange part is that after a few seconds I didn’t care much. And I laugh about it now. So ten Switchfoot concerts later, many stories and many miles traveled to see them and little has changed. I’m willing to go out on a limb and say that they are the best live performance that I’ve ever seen take the stage (although many have come close to matching them). And even though I now know them, I haven’t told Jon about the first time I saw them and the whole stepping on my hand thing. I’m sure he would laugh, but I think I’ll just keep that story to myself for the moment. Thank you so much for posing this question! It made me think about all those great memories from past shows. And there are a lot. Wow! That topic hit a good nerve! Backstreet Boys too. A really great story. Some of my favorite shows or performances have been in small ‘dive’ clubs. My bands have played in many small clubs and we usually hypnotized the crowd. Thank you, as always, for great comments, and this was a wonderful story. and by the way, I am not sure you kept the story to yourself LOL! Ha! Well, I kind of meant I didn’t tell Jon that story. I don’t want to embarrass him or anything, but I understand where you’re coming from. That’s awesome that your bands have played in small clubs! Sometimes those are my favorite places to see bands because the shows feel more intimate. Maybe it’s because everyone is crammed together like a bunch of sardines. No matter where you are in the crowd you can see the stage. (But I always love being right in the front for more reasons other then the fact that I’m short.) Sorry for the lengthy comments and if it seems like I’ve rambled on, but, as you can see, I can easily talk about music. As always, thanks so much for a great post! I’m glad I had a chance to read your story and share mine (and maybe sometime I’ll tell you about the time I walked into the back alley of the same venue to meet the same band. Ha!). Hope you have a good weekend! Just kidding! Ha! From a member in the audience, it is easier to see the performers. Watching them you can get the concept that while it is fun, it is very difficult and often takes a lot of concentration. From the band members point of view, you can see how the audience reacts. Often larger venues have stage and other lighting that can make the audience difficult to see. Sometimes you feel like you are playing for no one. WE ALL hated that. Please feel free to post and participate as much and as often as you want! And you can tell me about the back alley approach! Ha-ha “the back alley approach”…well, if you insist! I was 17 and I had pretty much grown up going to concerts at this venue. So I knew its layout as well as my own house. I knew the buses always parked in the back and security was pretty relaxed back then. I’ve always been a curious person, but in those days I was always afraid of something. Now I know the worse that can happen is someone saying “no.” For some reason, on this day, I stepped out of line (always going early to secure a spot in front of the stage) and walked down the back alley to the buses. It was the longest, scariest walk ever. The alley was full of graffiti back then that added to its creepiness. There were two buses and I just picked one, standing in front of it like I belonged and sipping on my hot chocolate (winter was just ending). On the inside I was freaking out a bit because I knew I wasn’t suppose to be back there. Technically. It was an unwritten rule. In the end it turned out I not only exercised a great amount of patients, but also picked the right bus. I actually blogged about this and my journey with the band. I’ll leave the link here in case you want to check it out (nicolesnarratives.wordpress.com/2015/02/17/what-a-journey-it-has-been-and-i-will-listen-until-the-very-end/). Of course some things have changed…like the fact my show count is 10 instead of 6 and the fact that we’ve had more meetings then are listed (at least 4 or 5 more). Some people who listen to their music are…obsessed…but I just seem then for what they are – a good group of guys who write meaningful music. Thank you so much for taking the time to tell your stories and listen to mine, as well as others! Never been to a concert because where I live, no concerts take place. Actually been to a concert during college. But it wasn’t that great. Would love to experience the feel of a ‘real concert’! Understood to the degree I can. The feeling as part of a large happy crowd gathered to see a favorite artist is difficult to describe. Nothing can match the sound (I know, I have tried!!!) but there is so much more as a total package …..and you can participate! The world changes slowly. I am sure it is difficult to wait for many things to change. Thank you for your thoughts. I really appreciate your comment. My first concert was the Jackson Five. They brought out their “little brother” at the end and he sang a song. The parents were in the audience. This was in Wellington, New Zealand. The booking office newspaper advert had printed the wrong phone number and I spent three days answering my phone and giving the right number. In the end, they gave me a free ticket for my troubles! Now, that would be very cool. Even today they still have an impact in musical culture. The phone number mix up is a great story! I am still laughing. Thank you for the first and a wonderful read. I think my first concert was Frankie Valli and the Four Seasons. It was the late 60’s, and my friends’ father was a professor at Monmouth College. The Seasons had a gig there right around Deedee’s birthday, so he sprang for multiple tickets. The next year he did the same thing with The Fifth Dimension. Wow, now that is one I did not expect! That was a great opportunity for you. Followed by the Fifth Dimension and you had a great live musical start. Thank you for sharing your first! First proper concert that I paid to go see and had to drive and wait for hours at the front of the gate was Ed Sheeran. That shows my age (25) but no one can deny his artistry. Who else can get away with just standing alone with a beat up guitar? No one. And you know why? Because there’s nothing that guy can’t do. He’s a bundle of creative genus and when he gets to looping, he explodes into a masterpiece. That is excellent. I do admire him and the variety of songs he writes. Great voice so this is a good first concert to see! Great to have your first concert known here LOL! Well, I’ve seen several growing up that I don’t think count because they were gospel singings my parents had to drag me to. This was my first time wanting to be there and being a HUGE fan, singing every word. I think that is the neatest thing a band can experience; watching the entire audience singing along with their original tunes! I agree, the dragging to a musical event of any kind does not really qualify LOL! Thanks again! I’m having a senior moment and cant remember. A bunch of friends and I went together, we were slightly intoxicated, well, maybe a bit more than slightly. The artist had log hair and a beard though, not that helps solve his identity, haha. That is why I take a lot of pictures…. I know I won’t be able to remember any of this in the not too distant future! Thank you for a great post! Yeah, my camera was stolen at that concert, haha. I also saw him with the Mahavishnu Orchestra eons ago! Amazing concert. That would have been memorable! Thank you for the comment and for the post! Ha! Very good. Back in those days you could do something like that and it was OK. A little more complicated now, but still a great experience to have and to share! Music has that ability! I saw the Beach Boys and the Kinks, an odd combination now that I think about it!! I don’t remember much about it except that I was wicked impressed, I think I must have been 17, seems like another lifetime ago! No, that is a great combination. The Kinks are a favorite of mine and you gotta love the vocals of the Beach Boys. That would be a really nice first concert. Good to hear. Amazing! I can understand that! Now that is a story to tell. That is pretty young for a heavy-hitter act like that. Thank you! Pearl Jam. And it was fantastic. The crowd was so pumped up and honed in on the music. That would be a great start! I have seen Pearl Jam and agree with the crowd enthusiasm. Very cool. Thanks! This was a good exercise then! LOL It helps to pull up details that seem lost. Thanks! Not a big fan myself of their music but I assume it must have been amazing to be in that moment, the band themselves and all the deadheads, the atmosphere… super cool. To answer your question, I don’t remember my first concert. I assume it was a local underground concert but not sure. It seems those that were fans of the band that ultimately played at their first concert the event was much more memorable. Many of us were not very familiar with the bands and don’t have many details, but that was a great observation. Thanks for the comment! Interesting that you learned about the Grateful Dead as a reference from the hip 60s musical HAIR. Everybody I know remembers the Dead, but not the musical Hair. I learned about them from my brother David, who asked if I wanted to got to a Dead concert. I said I had not heard of them and he quoted that line from the song “Hair” that was playing everywhere at the time. I later saw the play when it came to town, but I am not sure how much of anything I remember that long ago! Wonderful, thank you! I will check it out. The 2nd was the Rolling Stones. Everyone was smokin’ pot and standing on the seats. Wow. It is all downhill from there! I bet those were great events. Thank you. My first concert was billy idol in 1984, rebel yell tour. I was 14. It was amazing. Even though I was sitting in the last section on top, I couldn’t believe I was going to see billy idol on live on stage. I screamed, sang, and jumped up and down, which I still do. I wore my concert shirt to school the next day and I was like Yea that’s right I saw billy idol! I always buy a shirt. I like to express myself and music I love by wearing my shirts. I remember standing on top of folding chairs at shows! Once I fell through the chair. I also remember waiting in line over night for tower records and Sam goods to open to buy tickets. One time I was first in line and when the store opened the computers were down! It was for Unforgettable Fire tour. And dialing ticket master over and over on a rotary phone! Hahaha! You really are dedicated! I am impressed. Good to hear there are people really enjoying and supporting live bands. And you heard some great music too! Thanks and I will keep going. There’s nothing like live music and that energy in the venue. After u2 at msg, we were leaving singing the uh oh oh from pride in unison, just like singing how long to see this song in the 80s…it’s electric. I am really glad to hear that! I agree with the live performance and the energy a crowd can bring to the show. You Rock! And that helps the performers a ton. Yea!!!! I do rock  At melissa etheridge show she told the ushers to tell us to come down to the stage bc she feeds off our energy. It was amazing. I was literally in front of her. I could have touched her guitar, especially when she came down on her knee. I got great pics. I stood for over 2 hours jumping and screaming and yes my knees hurt the next day!!!! Now that is impressive. And brilliant! What a great way to get your exercise! Yea I think I drop about 5 pounds at each show. I am drenched and so thirsty afterwards. I’ll bet! Seems like a great idea for a TV series or a new diet book! I did get to go to the show, my friend gor tickets, Nassau collesium. Please excuse my typing errors. I’m still asleep. Very cool! I am always surprised by the popularity of international bands….. Sometimes bands have a hard time getting air play and recognition on their own country until they become famous overseas!! Doesn’t make much sense, but it happens fairly often. Big scale events are now so over the top I actually prefer smaller (but enthusiastic) crowds. I will have to look into Mutemath. I Ann not familiar with that name…. But I am bad with names to begin with. So glad to hear you are inspired to write a post! Can’t wait. Thank you so much for a great comment. My first concert was at Brockwell Park. London, and I saw the then “Desmond Dekkar and the Aces! It rained really heavily that day but no one was fazed, people were dancing, a lot of animated people! Very good! That is the power of a great audience. It is the event that draws power and excitement and rain or other factors are welcomed as part of that event. Love it!